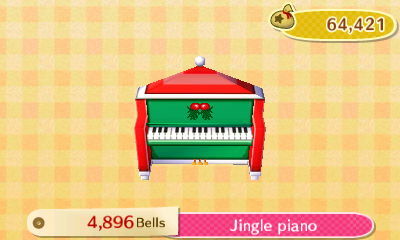 Those familiar with other iterations of Animal Crossing know that the end of December means Jingle the Reindeer is visiting your town. In Animal Crossing: New Leaf a further twist has been added to engage players with their animal neighbors throughout December, leading up to Toy Day on the 24th of December. 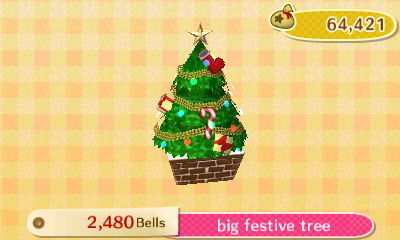 Toy Day, synonymous with Christmas in real life, is Animal Crossing's way of celebrating the festive season and ......doing some work?! If you've been ignoring your villager neighbors recently, it ends now! Starting on December 1st, it's time to chat, chat, chat... and write, write, write. 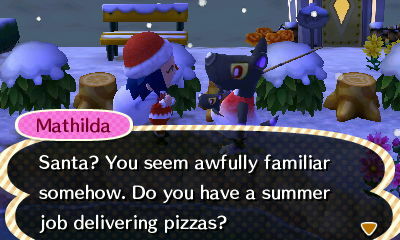 From the 1st of December, until the 24th, chat with your villagers and listen for unusual comments that they don't say the rest of the year. Your villagers will be trying to tell you what present they want for Toy Day by dropping two different hints. One of the hints is the color of the present, the other is the type of present they would like. Talk to them until you have both hints and make sure you write these hints down - or take screenshots. They may tell you again later but they won't repeat themselves immediately. It is necessary to get both hints because a particular color, or type of present, may be requested by more than one villager and knowing both hints will help you pin down exactly what each villager wants. No matter how early or late in the month you collect both hints, don't worry about figuring out what each present is. It will all become clear on Toy Day. Presents for the villagers, and therefore the hints that villagers give you, are fixed on December 1st and they will remain unchanged until Toy Day. However, if you time travel backwards outside of the day, or outside of the time period of December 1st-24th, the presents will reset! All your carefully noted down hints will also have become irrelevant and you'll have to start afresh. You can time travel forwards as long as you stay in the period between December 1st-24th. If it's Christmas, then there must be a Santa, right? And you're it! No Santa outfit? Don't fret. From December 1st up until the big day, the Able Sisters frequently sell the Santa Coat, Santa Pants, Santa Hat, and Santa Beard - everything you need to dress up as Santa Claus. 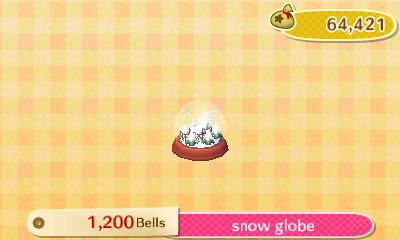 The Winter Range of clothes from the Able Sisters also includes the Festive Dress, which may or may not be available in your town in December. If it is, then you also have the option to dress up as Mrs. Claus during the festive season. However, on Christmas Eve itself you will need to be dressed up as Santa in order for Jingle to allow you to participate in the Toy Day festivities. 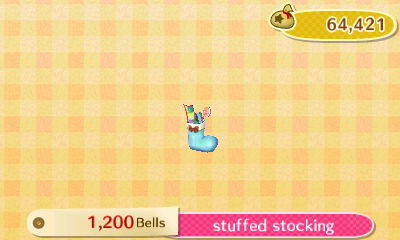 If your town is established enough, and you have Kicks' shoe shop, you can complete your Santa outfit by obtaining a pair of Santa boots - also available from December 1st. However, the Santa boots aren't necessary because Animal Crossing: New Leaf has considered that some people may recently have started their game, and not yet have Kicks' shoe shop in their town. To ensure that these players aren't excluded from the Toy Day event the Santa boots are optional. Jingle will make a remark when you don't wear the boots, but he figures no one will notice anyway so he lets it slide. And indeed, the villagers don't even notice any mismatched footwear. The other four clothing pieces - the Santa Coat, Santa Pants, Santa Hat, and Santa Beard - are essential to pass yourself off as Santa, and to be able to participate in Toy Day. 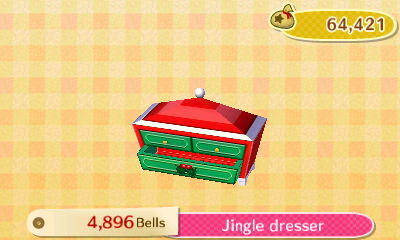 If you don't wear all four pieces, Jingle won't engage with you and the villagers will address you as yourself, not as Santa. If you forget to buy all or part of the Santa outfit, don't worry. On December 24th all of the necessary pieces will be available in the shops! One final item you can also add to your shopping list in December is the megaphone. If you don't already have one, but see one on sale at the Nookling's store, you might consider buying it. The megaphone can come in handy on Toy Day if you have trouble locating Jingle. As in other Animal Crossing games, December heralds the arrival of seasonal holiday items. 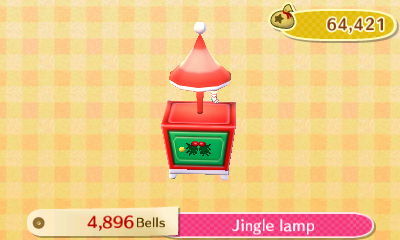 Unlike previous games where the Jingle Series items were obtained from Jingle as a reward, this time the Jingle Series items can be bought from the Nooklings. Between December 1st and December 23rd the Nooklings sell the following seasonal festive items. 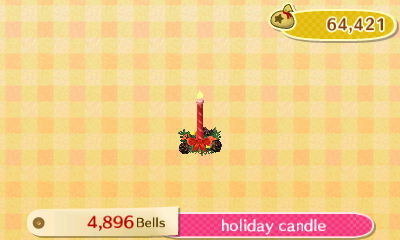 The Festive Flag and the Festive Candle are sold only in the American version of the game. 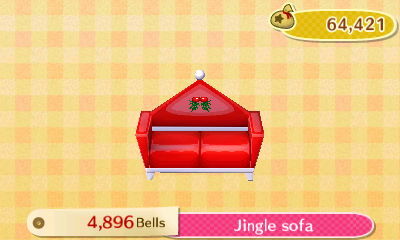 The rest of the festive furniture listed above appears randomly in the Nookling's store. So it's possible to have some items appear often, and some not appear at all. 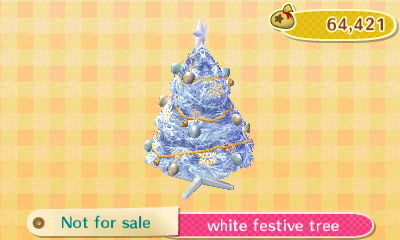 Additionally, the update Animal Crossing: New Leaf - Welcome amiibo has introduced more items to the game, including some seasonal items such as the White Festive Tree, which is acquired via SpotPass, and the Gift Pile which can be bought from Jingle at the campsite. 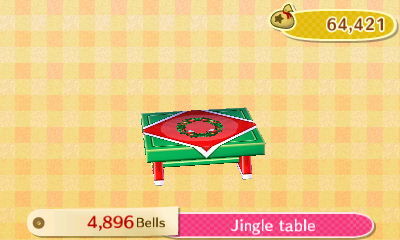 If you're happy to dress up as Santa or Mrs. Claus in December, and you are snapping up the festive furniture from the Nooklings, then you may as well really get into it and decorate your home too. Although not required, it is always lovely to mirror real life events and get into the festive spirit! 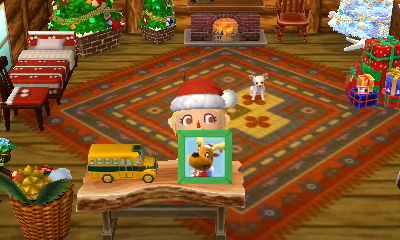 In addition to decorating your own home, don't forget that you can send your villagers some festive gifts by mail so that they too can decorate their homes suitably for the season. 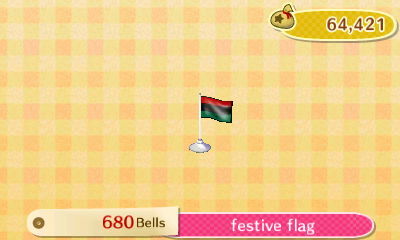 Of the seasonal holiday items, the Festive Candle and the Festive Flag are available only in North America, and the Jingle Series items appear randomly, so not everyone will obtain all of the items the first time of playing. 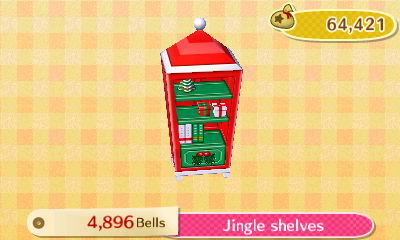 However, all of these items can be ordered from the catalog machine at the Nookling's store, and it would be reflective of the season of goodwill to help others to obtain missing items, as well as to allow others to help you. If you Wifi with friends, not only do items such as the Festive Candle and Festive Flag make a nice gift from American players to their unfortunate PAL pals, any gift given over Wifi at this time of year is well received when delivered by Santa or Mrs. Claus and wrapped in gift wrap. 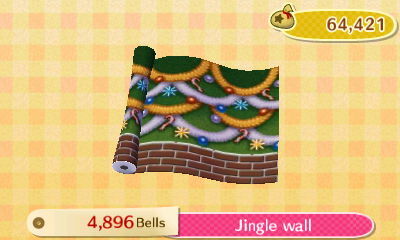 Remember that you can buy gift wrap from the Nooklings and this always adds a special touch to gift giving. In return, European and Australian players can open their gates on December 6 and invite other players not in the PAL Region to come over for Naughty or Nice Day where players can receive a Holiday Stocking from Isabelle. This is different to the Stuffed Stocking because the Holiday Stocking can be hung on the wall. If you use Wifi and have some of the festive items to share, try posting or responding to threads on the Trading Board so that you can pass on your spare items to others. If you are in need of items, you can instead post a request on one of the existing threads on the Giveaways Board or the Shops & Services Board. If you don't Wifi, take heart. 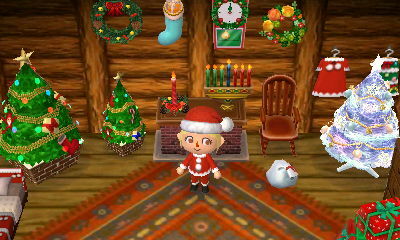 You can always complete your seasonal holiday items the following year, and you can still enjoy the festive season with your villagers. 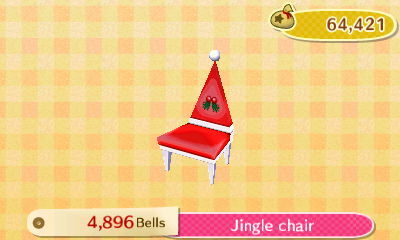 To get your villagers into the festive spirit, try walking around with some Santa coats in your pockets! Very likely they'll ask to buy or trade one from you and more often than not, they'll wear it too. 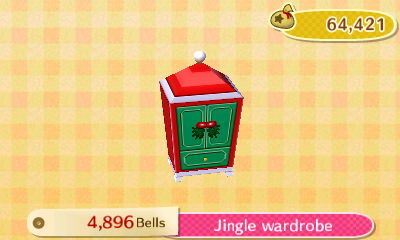 Furthermore, you can display festive patterns on a clothes mannequin at the Able Sister's; your villagers won't take hat or umbrella patterns. 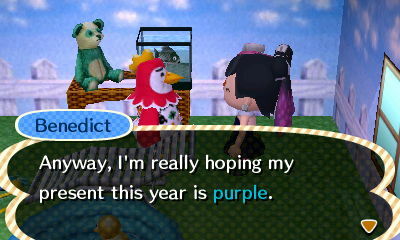 If you give it enough time, the majority of your villagers will be dressed for the season. The day of the 24th of December is pretty uneventful, but Santa doesn't deliver presents during the day, so nothing new there. Of course, you have the chance to buy the Santa outfit while the shops are still open so be sure to do that if you haven't done so yet. At 6pm precisely, Jingle can be found wandering somewhere in your town. If you can't find him, use your megaphone! Jingle will be carrying a Santa sack which he calls a bag. 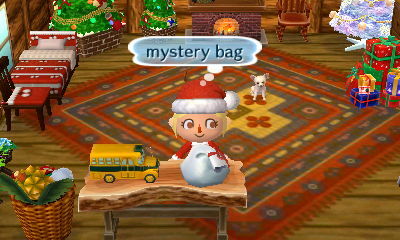 If you're dressed as Santa, Jingle will give you a bag too, and your bag will contain presents for your villagers. Jingle will then tell you that you have to hand out the presents. 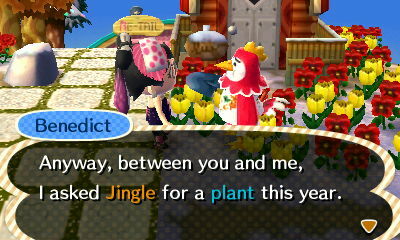 Well, you are Santa after all and, without you, your villagers don't get their presents. As usual, some of your villagers are inside and others are outside, but they are all eagerly awaiting their present, and none of them will be hiding in the museum or in the shops. No need to worry about villager bed times or illness either. A sick villager will be miraculously cured on the day but won't thank you for any medicine you may already have supplied. All other villagers will forget their bed times. 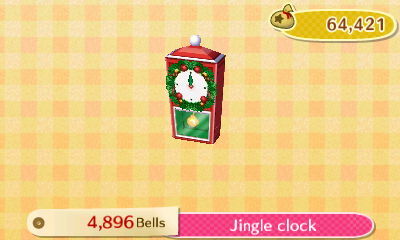 Since Toy Day runs from 6pm on December 24 until 6am the next day, villagers that haven't received their present will stay up until dawn. Once you have the bag from Jingle, to inspect the contents you simply go into your pockets, tap on your character, choose "Remove Equipment", tap on the bag, and choose "Check". This will reveal all of the presents in the bag on the bottom screen. 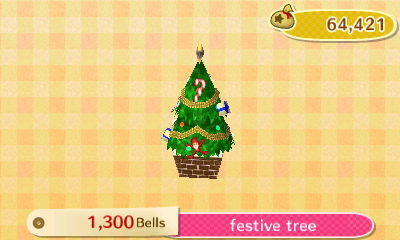 There will be 10 slots for the presents because you can have a maximum of 10 villagers. If you have less than 10 villagers you will see some empty slots for the missing villagers. To hand out presents, you should carry the bag over your shoulder and then initiate a conversation with a villager. Doing so will automatically show all of the gifts, for every villager, on the bottom screen of your console. If you have gathered both hints for each villager you can use the information below, provided by Liquefy, to discover which villager should receive what present. It's very rewarding to hand out the presents, and the villagers are very happy when you arrive as Santa. Some of them may get close to figuring out the secret that it's you playing Santa, but they don't catch on. 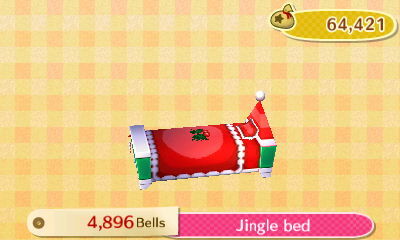 Once you finish giving presents to your villagers, report back to Jingle. He will give you the Festive Wreath as a reward for your efforts, even if you've delivered some or all of the presents incorrectly. If however, you've delivered the presents to the proper recipients, as a bonus, Jingle will send you a selfie in the mail the next day. What if you didn't get all or any of the hints? If you haven't collected hints you may choose to distribute the presents randomly. 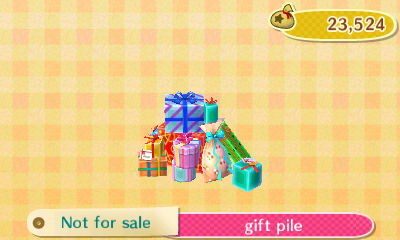 If you give a villager the wrong present, you'll know because they will be slightly disappointed. However, your villagers are a polite bunch and will still thank you for the present. It's Christmas, after all. Jingle will still thank you for distributing all presents by giving you a Festive Wreath when you report back. However, you won't get his picture in the mail next day. 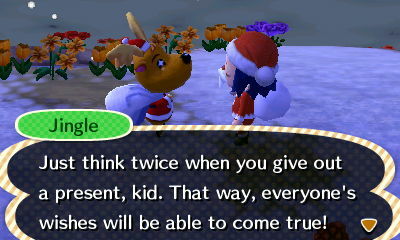 If you really want a picture of Jingle, you might consider quitting without saving after you've handed out the wrong present to a villager. It will take you a while to get them all correct but it will become easier the more you've distributed, and you can tell Mr. Resetti a white lie so he won't bend your ear. Whether you've distributed presents correctly or not, as long as you've given out all the presents and reported back to Jingle he will give you the Festive Wreath but he will take the bag - probably because it is really Santa's sack. 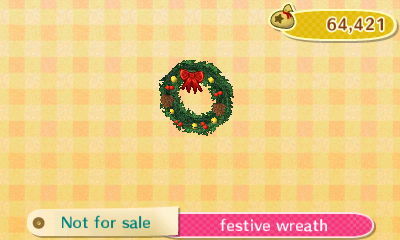 If you have more than one player, you can obtain both the bag AND the Festive Wreath in the same holiday. Use one character to complete Jingle's task and report back, and then use a second character to get a bag from Jingle but not report back. It doesn't matter if your second character distributes the presents or not. As long as you don't report back to Jingle, your second character will end up acquiring the bag while your first one acquires the Festive Wreath, and possibly Jingle's picture too. This is a great way for you to have your cake and eat it! Just be sure to have your second character wear the Santa suit too. After Toy Day is over, the bag is called the Mystery Bag. You can still walk around with the bag over your shoulder, but it's not functional anymore; it's become a handheld item, just like a balloon. You can put it in your dresser, or put it on a table in your room as part of your Christmas Decorations. 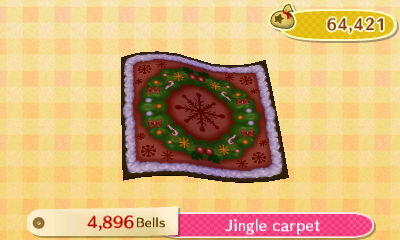 If you tire of it, you can throw it away in a trash can, or pay a disposal fee of 200 Bells at ReTail's. In summary, the following items can also be acquired on Toy Day. From all of us at Animal Crossing Community, we hope this guide allows your Toy Day to be a wonderful and jingly night for everyone! If you are in a really generous and festive mood you can have multiple characters play at being Santa and hand out the same presents again. 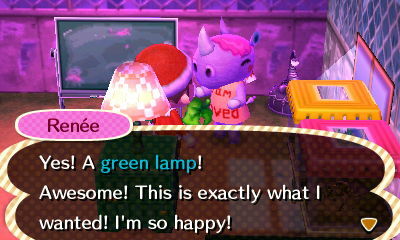 Your villagers will be happy - even when they get four identical presents! You can enter Resetti's lair dressed as Santa, but there will be no special conversation for this occasion. Well, that's no surprise, as you don't even have a present for those hard-working guys. 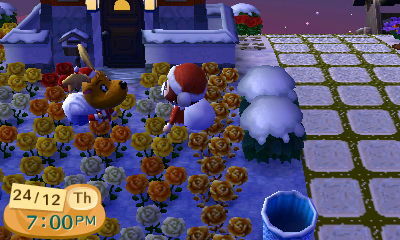 In fact, the only ones that don't see through your Santa disguise are your villagers, all other characters just plain ignore it. You can play Toy Day with gates open and/or someone visiting. The visitor can chat with Jingle but even when dressed up as Santa, the visitor won't get a Santa bag, and won't be able to hand out presents. You can only perform Santa duties in your own town. Jingle gives you the Santa bag, but after that, he still has a bag over his shoulder. So, there are two Santa bags... wonder what's in the other one? 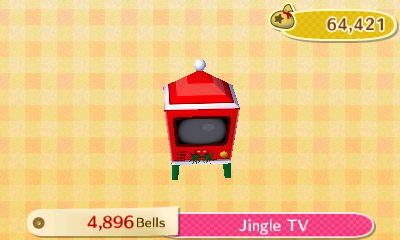 The selling price of the Jingle furniture is 1224 Bells and that is the date, 12/24, of Toy Day.